Storytime Issue 47 – Out Now! Why did the chicken cross the road? To read the new issue of Storytime Issue 47, of course! Especially as it stars the chicken world’s most industrious and famous character, Little Red Hen. We’ve written on our welcome page that kindness always wins the day. In Storytime Issue 47, you’ll find many examples of kindness (and silliness too). Little Red Hen is an interesting character because, at the end of the story, she doesn’t give in to selfless kindness. She lets the other farmyard animals get what they deserve. What do you think? Was she right to teach them a lesson or does her behaviour ruffle your feathers? Read on to find out more about Storytime Issue 47. 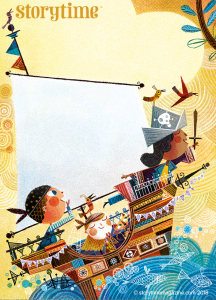 Fabulous art by Lucy Semple for Emily Cooper’s new story, The Seaside Scallywag in Storytime Issue 47. We’re delighted to feature a story from a new writer, Emily Cooper. 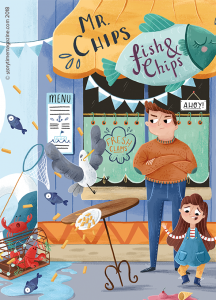 The Seaside Scallywag follows a greedy seagull called Sidney – a chip-scavenging, ice cream-stealing scourge of the seaside. The other seagulls have had enough, but one kind gull decides to give Sidney a second chance. Writer Emily is an English literature graduate and former journalist who teaches children with special needs. She loves writing bedtime stories for her two daughters, aged 5 and 9, and was inspired to write about Sidney following a family holiday in Whitstable. We think Lucy Semple‘s illustrations are the perfect match for this story. We couldn’t have opened the issue in a better way. Next we take you to the deserts of the Middle East for Zuleika’s Gift. It’s a story told in Saudi Arabia and Syria about the magical origin of the date palm tree. We highly recommend getting in some dates to nibble while reading this story. It’s not just an excuse for an exotic treat, but it also helps bring the story to life. We thank Nneka Myers for the joyous illustrations. For a bit of fun and naughtiness, we couldn’t resist Lewis Carroll’s iconic Tweedledum and Tweedledee. It’s a short poem, so easy to learn off by heart, and it should prompt some interesting discussions. Hopefully, it will also inspire you to read the Alice books! Momo gave us the fun illustrations for this. There’s more mischief in our Famous Fable The Fox, the Wolf and the Sea. We think kids will love the clever trick Fox plays on Wolf. They might even want to pretend they can do it too next time they visit the sea. We love the characters created by illustrator Pablo Olivero. 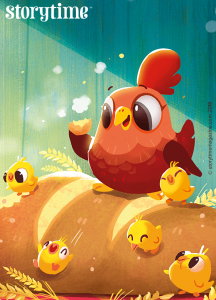 Little Red Hen bakes a loaf in Storytime Issue 47. With art by Meimo Siwaporn. 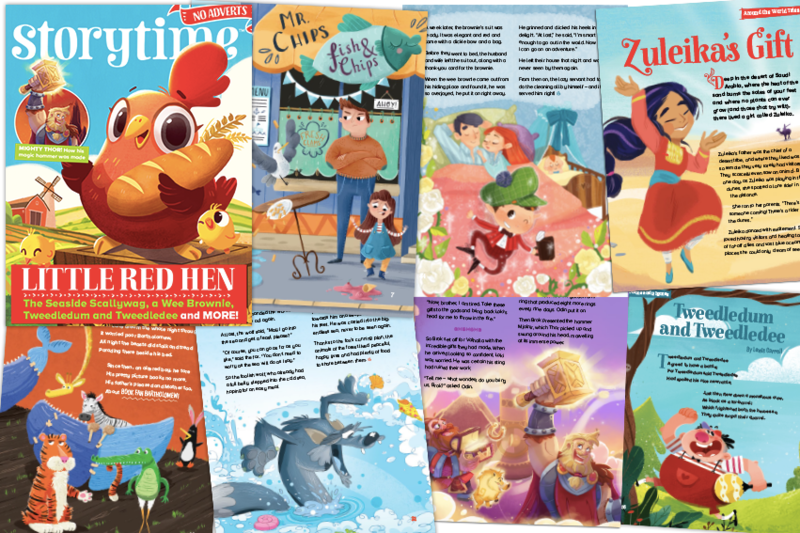 As mentioned, Storytime Issue 47’s fairy tale is Little Red Hen – a hardworking little chuck with big ideas. If you are a school subscriber, we’ll send you a free teaching resource pack to go with this story. (Find out more at Storytime For Schools if you don’t subscribe yet.) We were very excited to work with Meimo Siwaporn on the cover and illustrations for this story, who previously created the artwork for our Chinese horoscope myth, The Emperor’s Race (Storytime Issue 41). Kindness doesn’t just extend to people and animals – it can be shown to books too, as Mischievous Bartholomew discovers in this issue’s second poem. Parents of toddlers may empathise with the pain of seeing beautiful books ripped to shreds by curious little hands but, don’t worry, it all ends well. Our illustrations are by Paddy Donnelly. Thor makes his third outing in Storytime Issue 47. So far, we’ve seen him dress up as a lady to get his stolen hammer back, duel with giants and, in this issue, we discover how his mighty hammer was made. Cantankerous Loki makes an appearance too, of course. Michel Verdu returned to Storytime to create a mythical masterpiece for our illustrations. Finally, this issue’s folk tale comes from Scotland and features a fantastical little brownie who lives to help others. In this story, he saves the day when he helps a new baby into the world – and earns a special reward as a result. Dobby’s character in Harry Potter was inspired by legends of brownies. Our beautiful illustrations are by Sara Torretta, who has worked with us before on Storytime Issue 36‘s funny folk tale, The Mare’s Egg. Now Pack Storytime Issue 47 in Your Suitcase! Though this isn’t our official summer issue (that comes next month! ), it has a vibrant, colourful, summery feel, which will hopefully put you in the mood for that long break. Be sure to slip it in your suitcase, because no matter how much fun you have on the beach, there’s always time to squeeze in a story at breakfast, by the pool or at bedtime. And we’re always there for you on rainy days too. Do you have a favourite story or illustration in this issue? We’d love to hear what it is. Get in touch with us on Twitter, Facebook or Instagram and let us know. Let stories rule your roost this month! 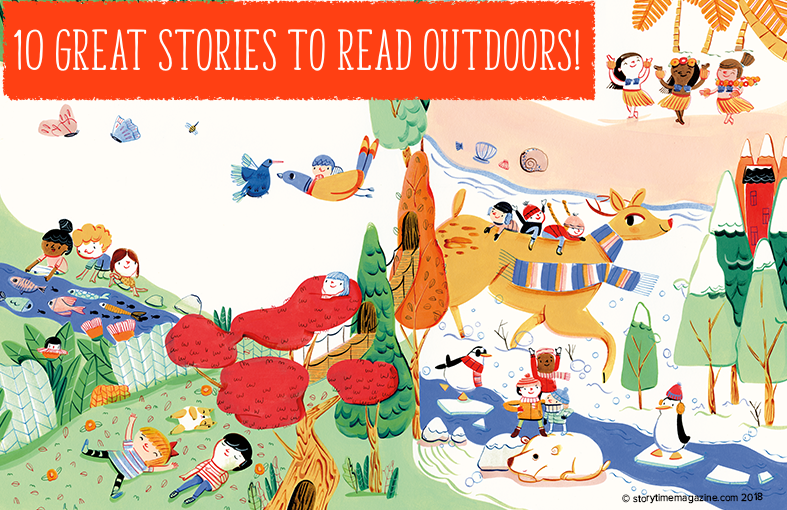 Summer is well and truly settled in, so what better time to grab a copy of Storytime and read outdoors? It’s warm, the world is alive with nature and there’s always a shady spot to welcome you if you look hard enough. Unfortunately, long daylight hours coupled with wonderful weather can put a stop to regular Storytime sessions, and outdoor play often takes the place of reading. In anticipation of the summer holidays, reading books and magazines can fall by the wayside. It’s a real pity, as you can get so much more engagement from children when you read outdoors. Does anyone else have happy memories of those rare, precious days at school when your teacher suggested going outside for stories? It was the ultimate form of escapism – not just into the welcoming world of fiction, but away from the stuffy heat and confines of a classroom. There’s lots of solid research on the benefits of outdoor learning and reading is a key part of that. You can increase engagement, enjoyment and learning even more dramatically by choosing stories that are set in the great outdoors too. This is an effective way to fire up the imagination. You can also springboard into activities that are linked to your story or stories. Use them to dig deeper into curriculum themes or areas that interest your child. In Storytime Issue 46, there are several stories we recommend you read outdoors, plus there are many more in our Storytime Back Issues. We’ve listed our favourites here with some ideas for activities too. Chorkung’s illustration for our firefly fable. 1. 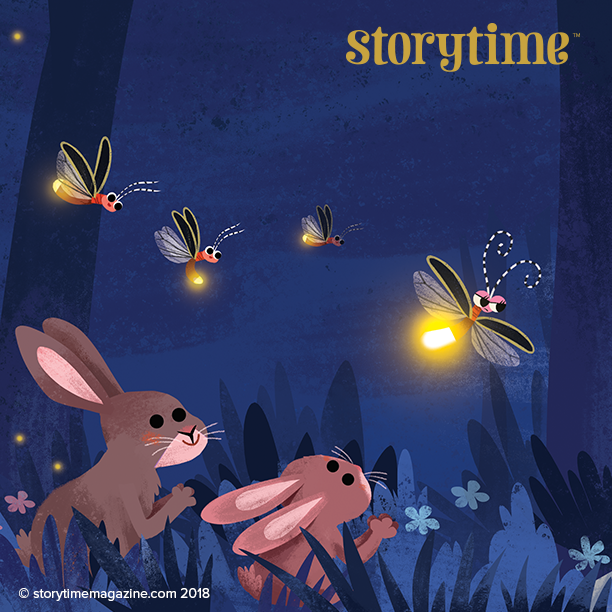 The Famous Firefly (Storytime Issue 46) This fable features a firefly who dreams of fame, but learns an important lesson about being thankful for what you have. Its beautiful illustrations by Chorkung are set in the garden during daytime and nighttime, so it shows a contrasting world of nocturnal and diurnal animals, and a whole host of creatures you can discuss. You can also talk about glow worms (which we have in the UK) and fireflies, and find out more about them. A great story to read in a green space. 2. Playgrounds (Storytime Issue 46) A poem by Laurence Alma-Tadema, which celebrates how skilled children are at turning any environment into a place of play – the garden, the seaside, the snow – and how adept they are at using their imaginations. You can read this poem just about anywhere and it still works, but read it in the local or school playground and it really comes to life. How about reading it alongside a Design Technology project to design the perfect playground? You could read it alongside Robert Louis Stevenson’s The Swing, which featured in Storytime Issue 3. 3. Alphabet Ocean (Storytime Issue 46) This is the ideal poem to pack in your case if you’re going to the seaside. Read it on the beach and imagine you’re swimming deep in the ocean and can see all the amazing creatures listed in our verse. Alternatively, take it on a trip to an aquarium and see the animals in our poem brought to life. Use it as a spotter’s guide. Can you find the whole A to Z we’ve written about in real life? Tick them all off. 4. Magic of the Rainforest (Storytime Issue 46) You might not have access to the Amazon, but an overgrown bit of garden or a forest coupled with a child’s imagination can transport you to anywhere. This story from South America’s famous rainforest follows the adventures of a little girl who gets lost in the jungle. She encounters some amazing fruits and animals. When you read outdoors, imagine you’re in the jungle too, then learn more about the rainforest and the creatures who live there. How does it differ from where you live? Follow a fruit trail and see what you find at the end. 5. The Great Snail Race (Storytime Issue 39) In a funny and clever tale from Laos, the local trickster is fooled by a smart snail. Read this story outside, then go on a snail hunt. When everyone has their own snail, host your own snail race or make little snail houses – a whole community of them. Perhaps they’ll get together and do something clever, just like in the story. 6. Doris the Singing Cow (Storytime Issue 36) Next time you go to the farm, take this story with you. It’s about a cow who auditions in a talent show and the farmyard friends who support her. It will put a new perspective on the animals you encounter and it’s a fun and imaginative way to begin a farm animal topic. Alternatively, read Henny Penny from Storytime Issue 19. The Butterfly and the Rose – great to read outdoors. 7. The Butterfly and the Rose (Storytime Issue 35) Make sure you’re surrounded by flowers when you read this one. You might just spot the butterfly and rose from this fable to really bring it to life for your audience. It’s not just a sweet story, it’s a springboard for learning about the crucial role pollinators play in the garden. Perhaps you could plant your own butterfly and rose garden? 8. Daffodils (Storytime Issue 31) What story could be better to read in spring than this classic by William Wordsworth? Reading it in the setting that inspired by the poem will help increase understanding of the words. Furthermore, you can demonstrate what the poet meant in his use of particular words and phrases. When you’ve finished, plant mini daffodils or make them from paper. Learn about the life cycle of a flower. 9. Betushka and the Wood Fairy (Storytime Issue 29) A magical story from the Czech Republic, set in a forest and featuring a fairy who loves to dance. Find a clearing in the woods and read this story, then wait for the magic to happen. Bird song plays an important role in this tale, so listen out for birds. See if you can spot any. Can you name them? Can you learn more about the country where this story came from? 10. 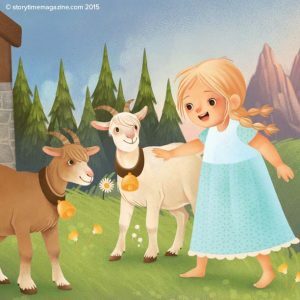 Three Billy Goats Gruff (Storytime Issue 10) This is a great fairy tale to read on the lawn, on the playing field or in the park – anywhere grassy – as you can very easily read the story and ask your children or class to participate and act it out. You don’t need a bridge – the imagination can do that part – or make one very easily by setting down a flattened cardboard box on the grass, or by using a wooden step or low stool. A towel can double for the river. As well as the stories in Storytime, there are hundreds of books that are great to read outdoors. Ever tried The Secret Garden in a secret garden? We recommend it! Pick a location or theme and spend a day in the fresh air mixing up fiction and activities. In fact, use summer as your opportunity to bring stories to life, rather than putting them to one side. You’ll see your child’s reading skills come on in leaps and bounds. What stories do you like to read outdoors? Or what are your favourite outdoor locations for reading in? Share your favourite outdoor reading spots with us on Twitter, Facebook or Instagram. We’d love to hear your ideas and share them with our other readers. You could even use the hashtag #readoutdoors. The more inspiration for fresh-air fiction the better! Let’s all read outdoors more this summer. 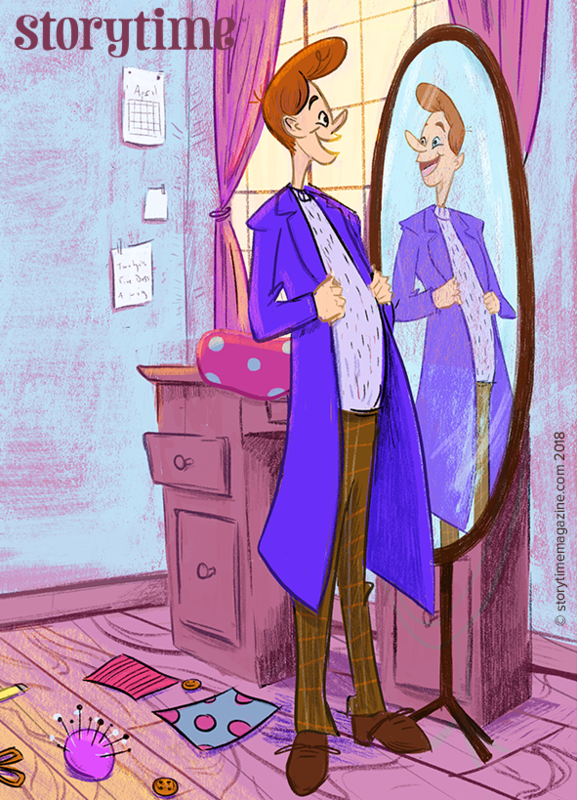 The Tailor’s New Coat – a folk tale illustrated by Forrest Burdett in Storytime Issue 46. The Tailor’s New Coat is an old Jewish folk tale with variants all over the world. It’s a really clever story with a surprise ending that will give you all something to think about. The gorgeous illustrations come courtesy of Forrest Burdett. The last two pages are especially magical. Our first poem of Storytime Issue 46 is by Laurence Alma-Tadema (not the famous Dutch painter, but his daughter). It explores the whimsical world of Playgrounds through the eyes of a child. What’s your favourite playground? This is a good poem to begin a discussion about looking closely at the world around you, using your imagination and finding the magic in everyday places. We love the creativity in the illustrations by Ana Sanfelippo. This issue’s fable follows the exploits of The Famous Firefly as she tries to widen the audience for her impressive light show. As with most fables, things don’t go quite to plan and she learns a valuable lesson. Can you guess what it is by looking at the pictures? This is a good technique to try with developing readers.Cn they tell the story in their own words before you read it to them? Did they guess right? Our super-colourful illustrations are by Chorkung. We’re really excited to bring you another fairy tale that tells the story behind a famous fictional character. In Storytime Issue 46, it’s the nursery rhyme favourite Old Mother Goose. (In Storytime Issue 44, we had Hey Diddle Diddle.) We’ve put together a fantastic Teaching Resource Pack to go with this story, which all schools and home schooling subscribers can get for free. Find out more on our Storytime For Schools site. 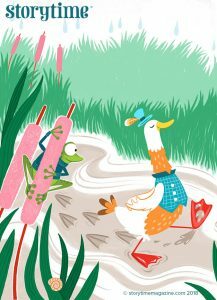 The wonderful illustrations are by Marine Cazaux, who had great fun creating Mother Goose flying away on the back of her gander. Alphabet Zoo fans will be delighted to see the artwork of Tim Budgen again for our one-off poem, Alphabet Ocean. This time, we dive into the deep blue sea to meet animals ranging from anemones to the zebra turkeyfish! To make sure you’ve spotted all the animals in our underwater A to Z, download our Alphabet Ocean posters here. Look out for more of Tim’s work in our October 2018 Storytime issue. 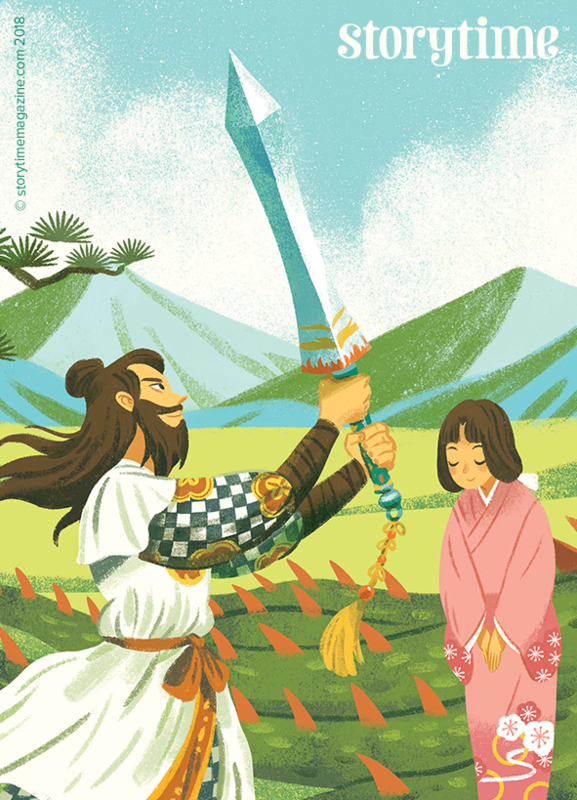 The storm god Susanoo wield a special sword in Storytime Issue 46’s Japanese dragon legend. Art by Bao Luu. We love a Japanese legend here and Storytime Issue 46’s doesn’t disappoint. It stars a stormy god who takes on a fearsome, people-munching Eight-Headed Dragon – with a little help from a famous Japanese drink. Illustrator Bao Luu has done a brilliant job of bringing this legendary hero and his enemy to life. Our last story transports you to South America, where you can experience The Magic of the Rainforest when a young girl loses her way. It features monkeys, a jaguar god and a magical blue morpho butterfly. It’s the perfect starting point for learning more about this spectacular part of the planet. Nathanna Erica is responsible for the lovely illustrations. Do have a look at her website – it is stunning. As ever, we’re tried to give you a great mix of stories from all over the world. There are six in this issue and two poems, and the more issues you collect, the bigger and better your library of stories will become. In fact, you could probably boast you own the best stories in the universe! Furthermore, you can come back to them again and again, because we print every Storytime issue on high-quality paper. Plus Storytime is a tried and trusted way to improve your child’s reading skills – we’ll be blogging about that soon! If you haven’t subscribed yet, you can do so here and become part of a passionate army of worldwide readers. Alternatively, you can pick up Storytime Issue 46 from our Back Issue Shop. We hope you think Storytime Issue 46 is as out of this world as we do. What are your favourite stories or illustrations? 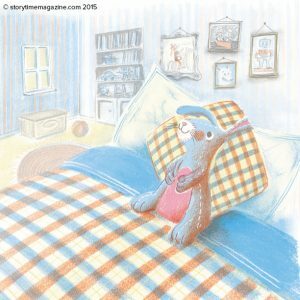 Are there any stories or poems you would like to see in Storytime? Is there anything you’d like to see more of? We value your feedback, so let us know via Twitter, Facebook or Instagram. 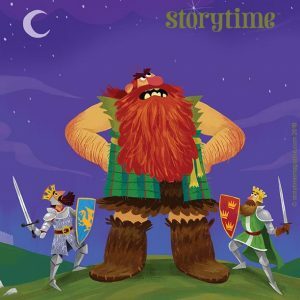 Sometimes the universe conspires to pair a story with the perfect illustrator, as is the case with Storytime Issue 45‘s fairy tale, Jack the Giant Killer, and the artist who brought it to life so brilliantly – Tom Knight. We had high hopes for this story because we can’t understand why it isn’t more popular and widely known. It’s the ideal follow-on fairy tale from Jack and the Beanstalk with an even braver hero and even better giants. It even comes with a good helping of ‘Fe Fi Fo Fum’. 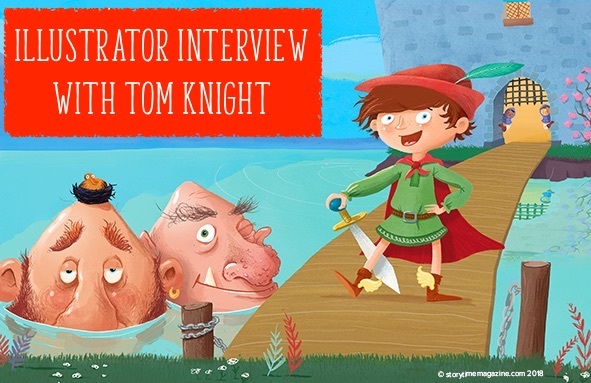 The campaign to win Jack the Giant Killer the fame he deserves starts here – and Tom’s illustrations are sure to help. Did we mention the giants? We caught up with Tom to get some insight into his life as a children’s illustrator and he gave us heaps of inspiration along the way. Ace illustrator of heroes, giants and animals rocking out in bands, Tom Knight. 1. Did you do an illustration degree? How did you get started in illustration? I had a very happy career in graphic design for a long time after I did my degree, but my work became more and more illustration based until I took the leap and started illustrating full time. 2. What drew you to illustrating for kids? I used to draw a lot of birthday cards for my friends to make them laugh. My friends all have a very childish sense of humour, so it was a natural fit to start illustrating for actual kids. Then I had children of my own, and so the idea of making art that they would find funny or affecting was very appealing. 3. What or who is your biggest inspiration? I think my biggest inspiration must be Hergé, the Belgian creator of Tintin. I loved the Tintin books so much as a child – the sense of place and adventure that Hergé created had a huge effect on me. As I got older I could see how amazing he was at drawing and creating his scenes technically too. He’s definitely my drawing hero! 4. What’s your illustration process? Do you have preferred creative medium and why? My process changes all the time! My studio is divided in two with my tidy computer desk on one side and my messy drawing table on the other. I always try to stay on the messy side for as long as possible! I do most of my colouring digitally because it’s so much faster (and easier to change later on for all those fussy art directors). But my favourite bit is looking through all my jars of pencils and pens and charcoal and choosing what to use. I usually end up using everything. 5. As well as illustrating for other authors, you also write children’s books. 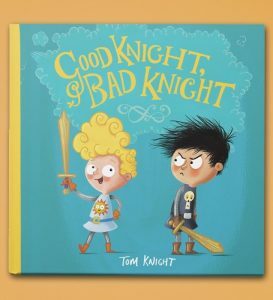 We love Good Knight, Bad Knight. How did you get into writing as well as illustrating? 6. You’ve done a brilliant job of Jack the Giant Killer for Storytime – thank you! What’s your favourite fairy tale and is there one you’d love to illustrate? That’s a good question! I’ve just finished a book for Scholastic about a very naughty bogey who romps through lots of fairy tales and spoils them all, so I had lots of fun drawing the wolf from Little Red Riding Hood and Cinderella’s palace, as well as lots more. I’d like to have a go at The Little Mermaid I think. I’m fascinated by the world under the sea, and would have fun painting all the colourful seaweeds. 7. Are there any exciting projects you’re working on at the moment that you can tell us about? At the moment I’m working on the next adventures of Good Knight, Bad Knight for Templar, which is very exciting. They are chapter books for older readers, and will be out later this year. There’s also The Big Bad Bogey written by Timothy Knapman, which will be out in September, and a spooky Halloween story called Bone Soup by Alyssa Satin Capucilli, which is out in July with Paula Wiseman Books. 8. Is there any past work you’re particularly proud of that you’d like to point to? 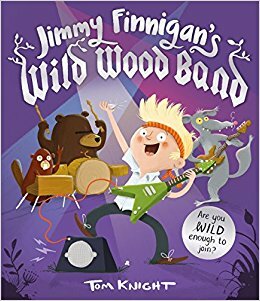 I’m very fond of Jimmy Finnigan’s Wild Wood Band, which was the second book I wrote for Templar. It joins my two passions, which are drawing picture books and playing music, so it’s quite dear to my heart. Plus I got to draw a lot of trees, which always makes me happy! 9. Your location on an island by the sea sounds pretty inspiring. Does it influence your work? If you could work anywhere in the world, where would it be? Yes, our island is quite an inspiring place! The nicest part is coming home when the tide is high (but not quite high enough to cover the road, which happens a lot). When there’s no wind, the sea looks like a mirror and all you can hear is the squawk of the seabirds – there’s no better place! BUT if I could work anywhere it would have to be Machu Picchu, which is a 15th century Inca citadel on top of a mountain in Peru. I’d never get any work done because I’d always be looking at the eagles and the condors. 10. 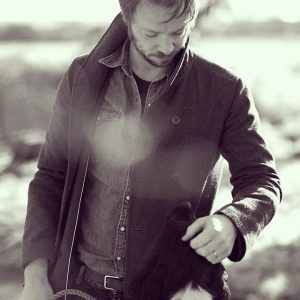 Are there any different creative areas or illustration styles you’d like to explore? Yes, all of them! I’m really interested in printmaking again, and also fabric and wallpaper design. I won’t rest until the world is covered in my drawings! 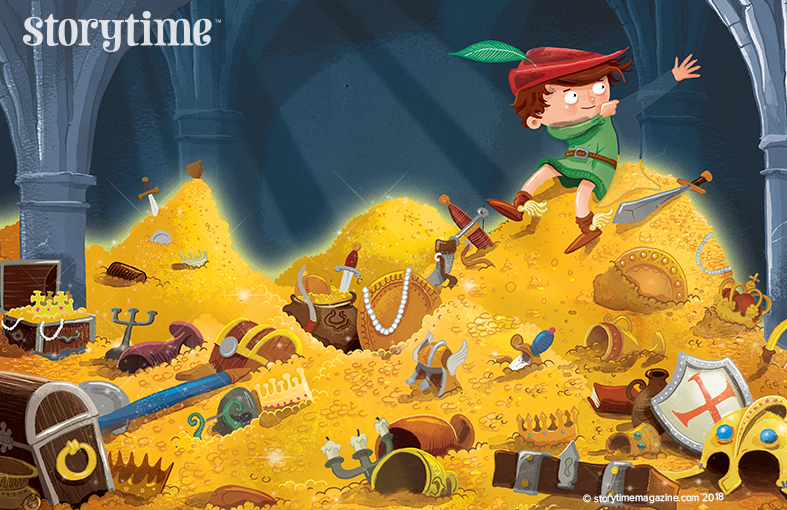 Jack discovers the giant’s secret treasure stash and tries on an invisible cloak for size in Storytime Issue 45. Illustrated by Tom Knight. 11. Is there any advice you can give to aspiring illustrators, young and old? I would say learn your craft first, and the most important part of an illustrator’s craft is DRAWING. You can’t draw too much. Draw everywhere, all the time! Draw on the bus, draw in the bath, draw while you’re watching telly. You probably shouldn’t draw when you’re mum is telling you off (she won’t like it) or if you’re driving a car. It would also be useful for you to learn how to use Adobe Photoshop too, because you’ll definitely need it at some point. Finally, remember to be interested in everything! You never know where your next idea is hiding, and you don’t want to miss it. It might be behind you RIGHT NOW! Fantastic answers and loads of inspiration. Storytime illustrators really are the nicest people in the world. We can’t leave it at that without urging you to visit Tom Knight’s website and encouraging you to check out his print shop, which features a rather wonderful Hunt for the Wilderpeople print. 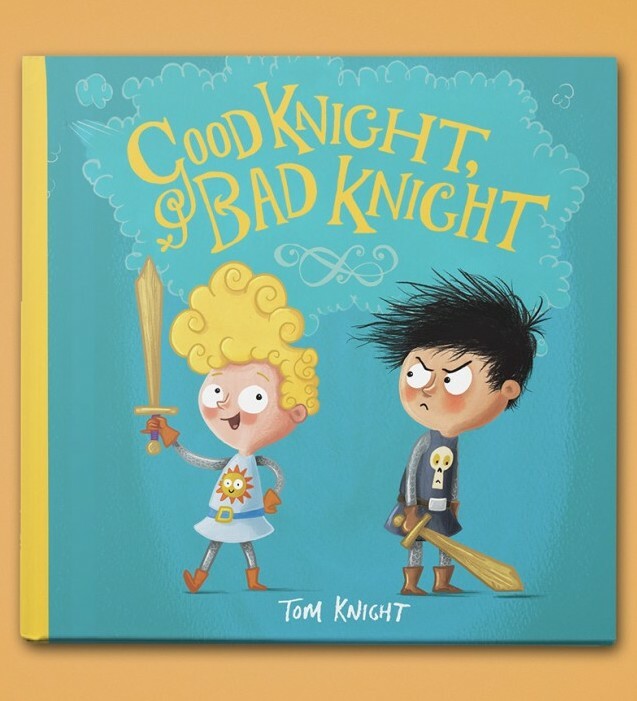 Also, for more eye candy, fabulous giants and brave knights, check out Tom’s blog, his Instagram feed and show your support and admiration by following him on Twitter too. Best of all, buy his books! Many thanks, Tom, for taking the time to speak to us. See you next time, story lovers! Storytime Issue 45 – Out Now! Giants beware! Storytime Issue 45 has been unleashed on the world and the star of this new issue is boy hero, Jack the Giant Killer! 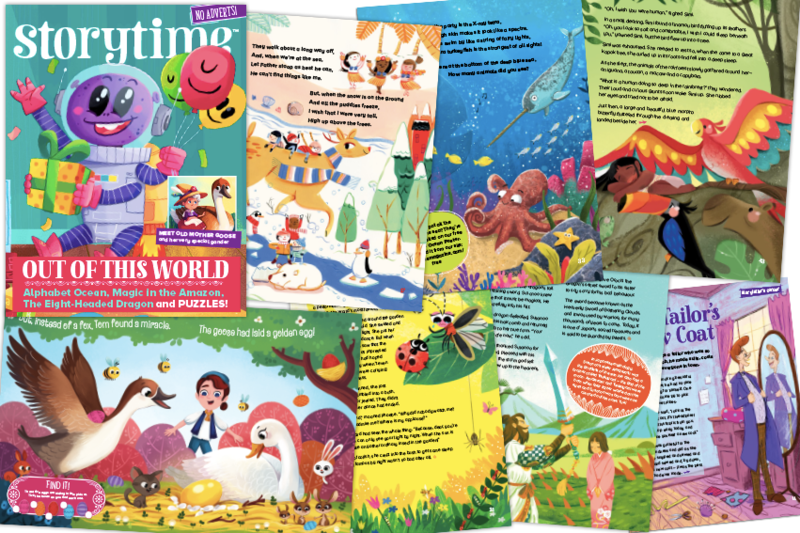 This issue features heroes large and small, stories new and classic, poetry to make you smile, tales to tickle your imagination and activities to keep your little ones happily occupied (while stealthily learning). If, for some unfathomable reason, you haven’t subscribed yet, join our worldwide team of story lovers here. Alternatively, you can pick up Storytime Issue 45 in our Back Issue Shop, so don’t miss out! For more about what’s inside our issue and our amazing contributors, read on. 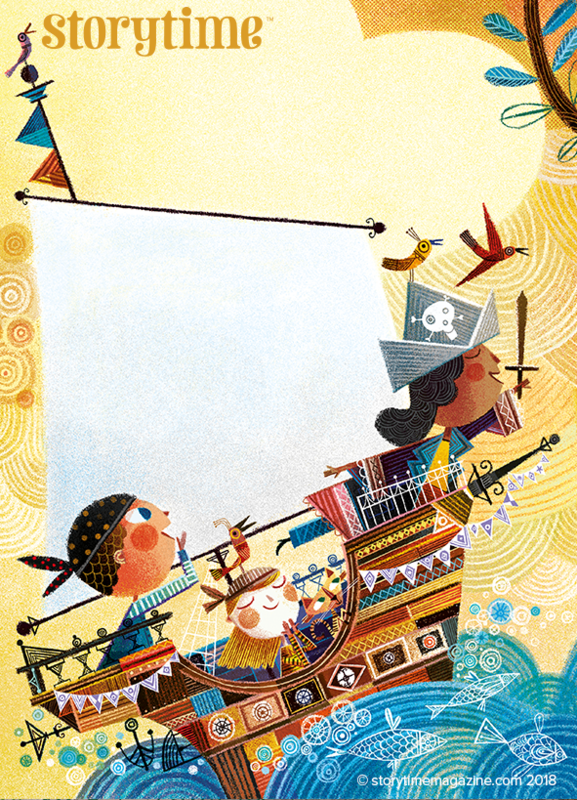 Dreaming of pirates in a poem by Mabel Forrest. Art by Rogerio Coelho. Opening Storytime Issue 45, we’ve got a sweet story by children’s author Amanda Brandon called The Royal Birthday Surprise. Prince Henry has a long list of demands for his birthday party, but it doesn’t go quite as planned. Thankfully, his little (and only) guest has big ideas. Lovely illustrations are by Jessica Gibson. Our first poem of the issue is an abridged version of My Dreams (originally called Boy Dreams) by Mabel Forrest. It’s a fantastic exploration of a child’s imaginative dream world. It features pirates, fairies and mermen, so it can be a great starting point for fun role-play. Incidentally, you might recognise the illustrations of Rogerio Coelho, who has illustrated for Storytime several times. Nancy and the Pixies is an old British folk tale, supposedly based on a true story. It’s about a woman who doesn’t believe in magic. We love the final image in this story of a pyramid of playful pixies proving their point. The whimsical art is by Tatiana Petrovska. You don’t have to see to believe, readers. 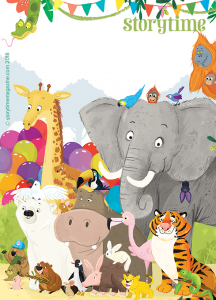 Farewell to Alphabet Zoo in Storytime Issue 45! Art by Tim Budgen. In this issue, we’re sad to announce that our long-running poetry series Alphabet Zoo comes to an end. The last poem features animals beginning with the letters X, Y and Z. It seems to have flown by and we’ve been incredibly lucky to work with illustrator Tim Budgen. Can you believe we featured 64 animals in total? That’s a very busy zoo. If you missed any issues, the series ran from Storytime Issue 29 onwards, which you can pick up from our Back Issue Shop. Don’t forget, you can also print out our Alphabet Zoo Activity Packs with puzzles and posters on our Downloads page. Tim Budgen fans can catch our interview with him here. Also look out for next month’s issue, when we dive into a special Alphabet Ocean! Now to our cover star and Favourite Fairy Tale, Jack the Giant Killer. It is brilliantly illustrated with the most amazing (and amusing) giants you’ve ever seen by Tom Knight. This is one of those fairy tales you’ll be familiar with but might not know well. Jack has many parallels with Jack and the Beanstalk (from Storytime Issue 5 – buy the back issue here), but they are two distinct characters. The Jack in this story is a bit bolder and braver and takes on not one but five giants, including one with two heads! Jack and the Beanstalk fans will love following his adventures. From adventure to the absurd in our Around the World Tale from Poland. Kopytko is a cobbler with gigantic ears, a duck sidekick and a penchant for playing pranks. However, when he takes one practical joke too far, he learns an important lesson. The illustrations should hopefully make you laugh and are by Rodrigo Folgueira. Throughout Storytime Issue 45 we also give you activities and mini challenges. As with every magazine, we also end with puzzles, drawing, colouring, a craft, a story-themed board game AND our books of the month (enter to win a book here!). We really do try to cram each issue full of story goodness for you! We hope you enjoy it. Let us know your thoughts on Twitter, Facebook or Instagram. We’re always happy to hear from you. Watch out for two-headed giants! Though Storytime‘s regular Poems and Rhymes strand is mostly dedicated to children’s poetry, we like to mix it up and include classic nursery rhymes or songs. In Storytime Issue 44, we’ve mixed it up even more by featuring a fairy tale by L Frank Baum, which explains the fantasy origins of the famous nursery rhyme Hey Diddle Diddle. We’ve thrown in the rhyme too for good measure. 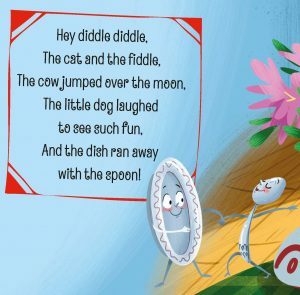 Hey Diddle Diddle is an iconic nursery rhyme bursting with imagery that fires up the imagination. On closer inspection – like most nursery rhymes – it makes little sense. Many intellectuals have tried to trace the origins or deeper meaning of this rhyme, but the general consensus is that it’s nonsense – nonsense powerful enough to have lasted for hundreds of years though. In this time, there have been a few variations of Hey Diddle Diddle. A fork ran away with the spoon at one point and, in some versions, a pig jumped over the moon, which makes more sense because, as we all know, pigs can fly. Perhaps our favourite legacy of this nursery rhyme is that it spawned the phrase ‘over the moon’, meaning extremely happy. 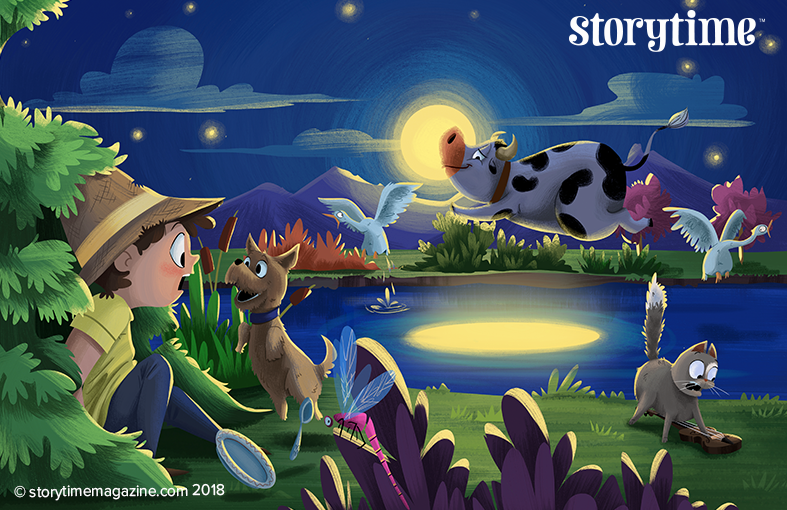 We’re over the moon to feature both the story and the nursery rhyme in Storytime, because we know that nursery rhymes play a crucial role in improving childhood literacy. 1. Lots of studies, including this one, show that sharing nursery rhymes with young children has a positive impact on their phonics skills and language abilities as they grow older. It helps them develop an ear for language and the rhythm and beat of how sentences are structured. 2. 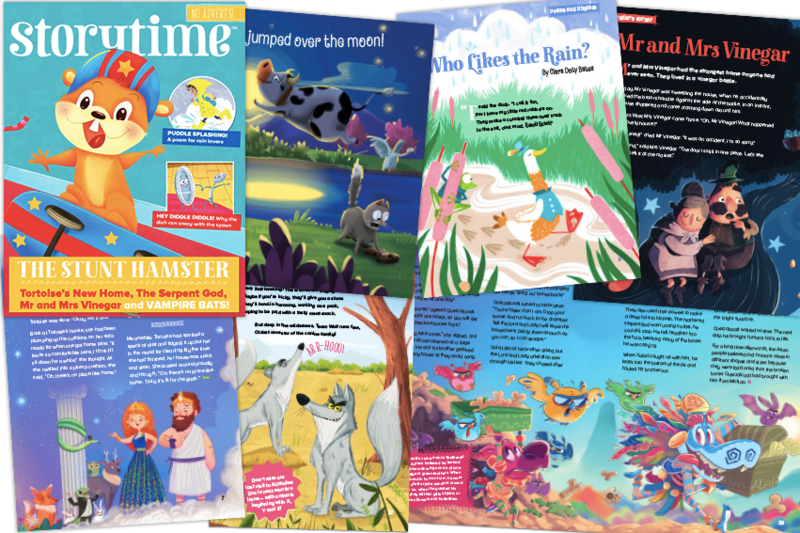 If you take a break from saying nursery rhymes out loud and refer to our magazine or a book, make sure you point out the words as you read them. This helps children to make the link between sounds and letters, improving their recognition of words and also their ability to use rhyming words at a later stage. 3. If you play as you share nursery rhymes, the result is even more powerful. You can clap along, use puppets, act out the rhyme with toys, do actions – whatever works best for you and your child. The simple act of bringing a nursery rhyme to life makes it more memorable, but also makes it more engaging and fun, leaving your child with a good feeling about language and reading. Download our Hey Diddle Diddle Finger Puppets here. 4. Hearing nursery rhymes improves listening and concentration skills, but hearing them repeatedly also boosts memory skills. Try to miss out words when you say an oft-repeated nursery rhyme out loud and, in time, your child will fill in the gaps. 5. Finally, sharing nursery rhymes is an opportunity to spend quality time with your child and it brings you closer together. Possibly the best reason of all. And there’s no need to abandon nursery rhymes when your children are older. Kids enjoy the absurd and many nursery rhymes are equal in absurdity to the works of literary greats like Edward Lear and Lewis Carroll. This is one of the many reasons that nursery rhymes have endured. Plus you can challenge older children by asking them to make up their own nonsense nursery rhymes, or ask them to change rhyming words or characters in existing rhymes. What happens if the word ‘Diddle’ changes in Hey Diddle Diddle? Or if the cow jumps over the sun? You can pick up these issues in Storytime’s Back Issue Shop. We hope you enjoy sharing L Frank Baum’s story (just in case you didn’t realise, he is the brilliant creator of The Wizard of Oz) and have fun sharing nursery rhymes too. Don’t underestimate how powerful they can be! Storytime Issue 44 – Out Now! One of the great joys of creating Storytime is bringing you new stories in addition to well-loved classics. 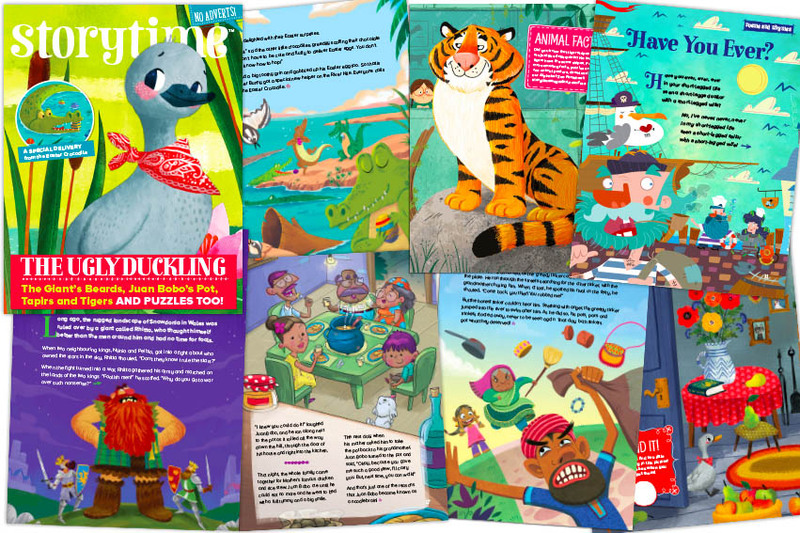 In Storytime Issue 44 we’ve had a ball, creating a character we think kids will love. Sammy is a skateboarding stunt hamster who defies expectations and proves that you can be brave and brilliant no matter how small you are. As ever, there are lots more brilliant stories and poems inside this issue. Find out more about them here. Storytime Issue 44 kicks off with an unusual fable, Tortoise’s New Home – unusual in that it not only teaches the usual lesson in life, but also explains the origin of how the tortoise got its shell. This kind of story is great for getting kids thinking creatively about how various animals or features in the natural world came to be. You can use it to kick off your own story-writing activity. How did the elephant get a long trunk? Or how did the platypus end up with a flat beak? Illustrations are by Lais Bicudo. Ducks love the rain! From our puddle-splashing poem, illustrated by Alisa Coburn. As I type, spring in the UK seems to be refusing to put in an appearance, so our poem by Clara Doty Bates, Who Likes the Rain? may be met with a universal “Not me!” Don’t let the title deter you because the poem is a celebration of rain in all its puddle-splashing glory. It comes with fab illustrations by Alisa Coburn. Our Alphabet Zoo poetry series, illustrated by super-talented Tim Budgen is still going strong and, in Storytime Issue 44, covers animals beginning with U, V and W. Look out for howling wolves, hilarious wombats, vicious vampire bats and a bird that’s well suited to our rain poem! Don’t forget to download our free Alphabet Zoo Activity Pack too, which comes with animal facts, puzzles and a poster. We travel all the way to Cambodia for our Around the World Tale for an inspiring tale about a smart princess who outwits a trio of greedy baddies with her engineering skills. Clever Amaradevi is illustrated by Lenny Wen. Next stop is Central America and an Aztec myth about how Quetzalcoatl brought humans back to life in The Feathered Serpent God. Illustrator Guille Rancel has done a brilliant job of visualising this awesome god and we’ve put together a whole pack of Aztec educational resources for teachers to use in the classroom. School subscribers get this pack for free or you can buy it here. Hey Diddle Diddle in Storytime Issue 44, art by Begona Fernandez Corbalan. Our Favourite Fairy Tale in this issue is by the creator of The Wonderful Wizard of Oz, L Frank Baum, and gives the famous nursery rhyme Hey Diddle Diddle a fun back story. 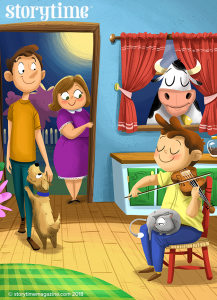 All the characters are here – the cat, the fiddle, the dish, the spoon and a cow who jumps over the moon. Our lovely illustrations are by Begona Fernandez Corbalan. Finishing off the issue, we have a funny folktale in Storyteller’s Corner called Mr and Mrs Vinegar. Find out what happens when catastrophe strikes and they accidentally smash the vinegar bottle they live in. We absolutely love Simone Kruger’s illustrations for this. 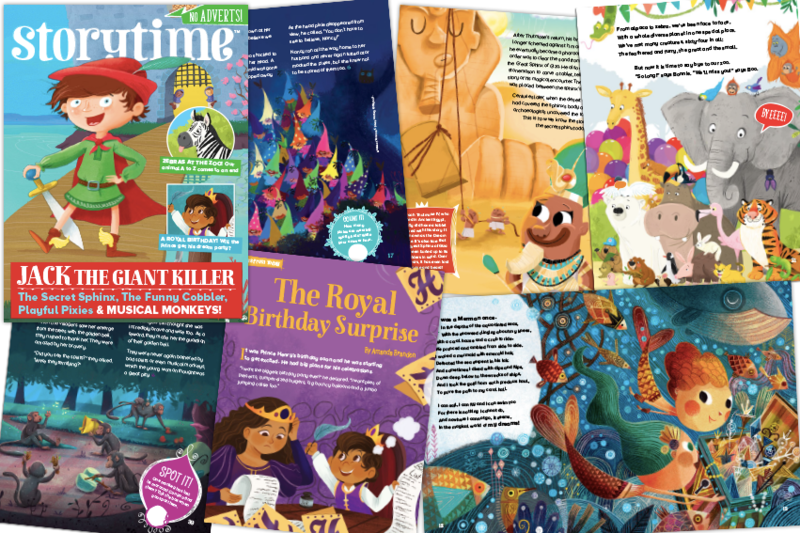 We hope you have fun travelling back in time and around the world with us in Storytime Issue 44! As usual, we’ve packed this issue to the hilt with stories, poems, activities, puzzles and some brilliant book recommendations too. We love taking you on adventures, especially with skateboarding hamsters, and there are many more to come. Which story is your favourite? Any classics you’d love to read in our magazine? Let us know on Twitter, Facebook or Instagram. We’d love to hear from you. Easter means different things to different people. Whatever you think of it, for most children in the Western world, even those with religious beliefs, Easter means chocolate. We’re all for a bit of choc in the Storytime studio. However, if you feel like escaping the gluttony, why not use the long weekend as an excuse to share some of our favourite Easter stories for kids? We’ve picked out some of our favourites. 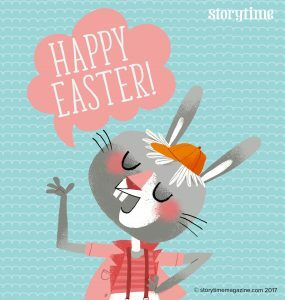 Why not flick through your Storytime back issues and hold an Easter story session? Our selection features chocolate, chickens, bunnies and even an Easter Crocodile. Because why should fluffy animals have a monopoly on Easter? 1. 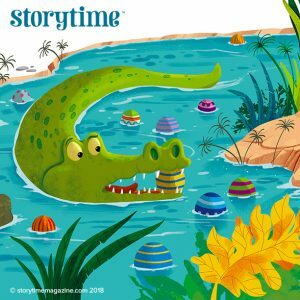 The Easter Crocodile in Storytime Issue 43. This story by Dylan Rourke came from a simple idea. Who delivers the Easter eggs in countries that don’t have cute bouncing bunnies? Rocky is a croc with a passion for choc, so when the Easter Bunny catches a cold, Rocky steps in to save the day. Except it’s not easy carrying eggs when you’re swimming down a river. Find out how Rocky gets around the problem. With art by Giovanni Abeille. 2. Augustus Gloop’s song in Storytime Issue 2. Greedy Gloop gets what he deserves! If this extract gives you a taste for more, tuck into a full serving of Roald Dahl’s Charlie and the Chocolate Factory. Surely the perfect Easter read? 3. How Rabbit Got Long Ears in Storytime Issue 3. Kids love this Native American tale of how the mischievous rabbit ended up with long ears. Plus it’s always good to open their minds to stories from different cultures too. 4. 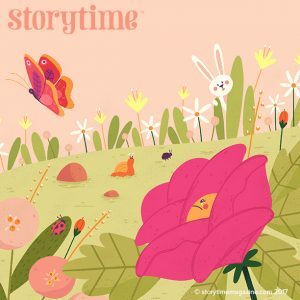 Persephone and the Seasons in Storytime Issue 5. A fantastic Greek myth about how the seasons came to be, with stunning springtime illustrations. A great starting point for discussing the seasons and we have a Seasons Activity Sheet to download too. 5. The Velveteen Rabbit in Storytime Issue 9. Our extract of this classic story by Marjery Williams features the world’s most adorable rabbit. It also makes you completely nostalgic for childhood and gives you a new appreciation for your child’s bond with their toys. 6. Hans the Rabbit Herder in Storytime Issue 12. This Grimm brothers’ tale is sheer good fun. It sees Hans win the hand of a princess through good luck, determination, quick wit and a hundred hopping rabbits. 7. Dolly Daydream in Storytime Issue 18. Dolly’s dreams of cute chicks, chickens and eggs go a little bit wrong in this funny fable. Kids will adore the colourful illustrations in this story. 8. Henny Penny in Storytime Issue 19. Also known as Chicken Licken, this story has so much going for it – vibrant and eye-catching illustrations, repetition (which is a secret weapon in helping kids to fall in love with reading – learn about it here), funny names and loads of humour. 9. Brer Rabbit in Storytime Issue 19. This trickster is hugely popular for his mischief-making in American folklore and is just as well loved on this side of the pond. Find out how he tricks Brer Fox and Brer Bear in this well-loved but little-told tale. 10. 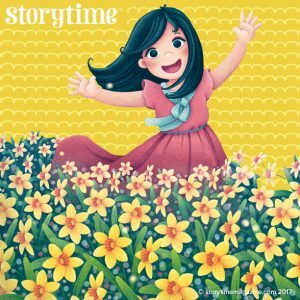 Daffodils in Storytime Issue 31. Daffodils are the ultimate icon of spring and Easter, so what better poem to share at this time of the year than William Wordsworth’s homage to this happy flower? Our extract from this famous poem is ideal for learning off by heart if you feel like showing off after Easter lunch too! If you’re a school subscriber and want to get hold of our Daffodils Teaching Resource Pack for this poem, drop us a line from your school email address to hello@storytimemagazine.com. Alternatively, if you’re a school and would like to subscribe, visit our dedicated schools website. Incidentally, if you’re hankering after fluffy ducklings, Storytime Issue 43 also features The Ugly Duckling by Hans Christian Andersen. This story comes with an important message about acceptance and kindness. Whatever your beliefs, it’s a lesson we all need to remember. Finally, we hope you enjoy these Easter stories for kids. Happy Easter everyone – enjoy the chocolate and happy story reading too! Storytime Issue 43 – Out Now! When we had the idea to launch Storytime magazine, one well-meaning soul suggested we might run out of stories. No chance! 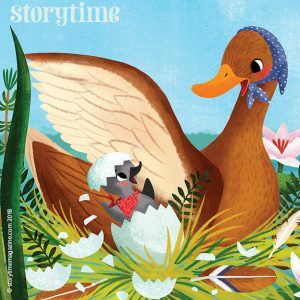 We’ve made it to Storytime Issue 43 and we’ve had so many stories to pack in, Hans Christian Andersen’s Ugly Duckling is only just putting in an adorable but scruffy appearance. Rest assured, we will never run out of stories. Storytime Issue 43 is special. Not just because it features the long-awaited Ugly Duckling, but because it has one of my favourite ever stories in it – I’ll reveal what it is below – and it has a lovely Easter story too. As usual, we’ve crammed it full of great content to help children at home and school discover the joy of reading. The illustrations that go with our stories are an important part of encouraging that passion. They help bring characters to life and make words more memorable, so find out more about our brilliant contributors below. The adorable Ugly Duckling ‚Äì who could possibly reject him? Art by Miriam Bos. School subscribers will be receiving our free Ugly Duckling resource pack full of lesson ideas for literacy, PSHE, science, art and more, so you can explore this classic fairy tale in more detail. The Easter Crocodile is a funny new story by Dylan Rourke about a little crocodile who decides to step in when the Easter Bunny falls ill. But how exactly do you deliver chocolate eggs across a river on a scaly back? We hope you enjoy it along with the fabulous illustrations by Giovanni Abeille. Matteo Gaggia’s fun illustrations for our Storytime Issue 43 action rhyme Have You Ever? Our first poem of the issue is the wacky and wonderful Have You Ever? 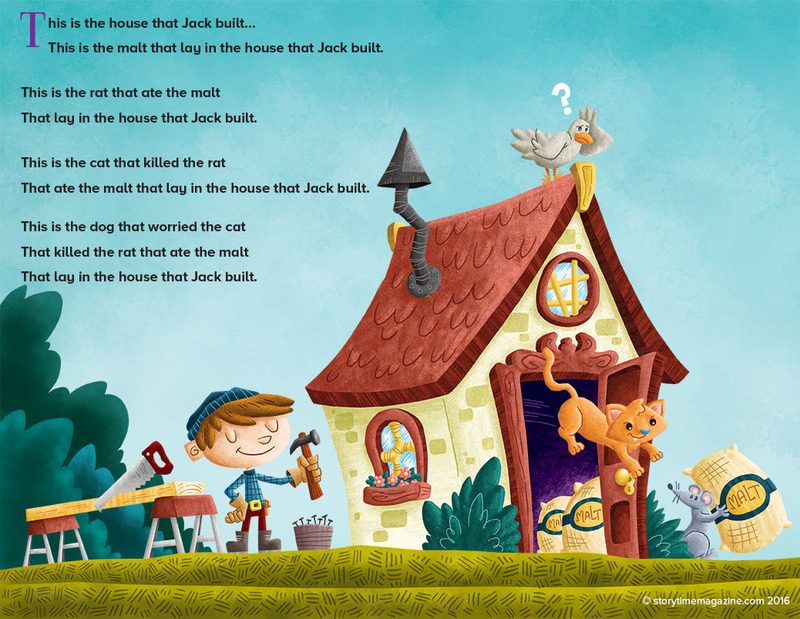 This is a great action rhyme, which kids will love getting involved with. Give it a go too and you’re sure to end up laughing. Bonkers illustrations are by Matteo Gaggia. Our Around the World Tale comes from Puerto Rico this month and features a favourite fictional character from that area called Juan Bobo. Bobo means ‘blockhead’, so you can probably guess how the story goes. Every culture has its own fool stories and we just love discovering new ones. We hope you do too. Juan Bobo’s Pot is illustrated by Andr√©s Pab√≥n. 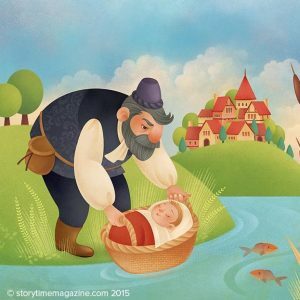 Another heart-warming tale in this issue, besides The Ugly Duckling, is our folktale in Storyteller’s Corner: The Clever Carpenter. It tells how a brother and sister who fall out with each other are reunited by the kindness of a stranger. It’s a lovely story from America with sweet illustrations by Marina Pessarrodona. Now for one of my favourite stories ever – The Giant’s Beards. 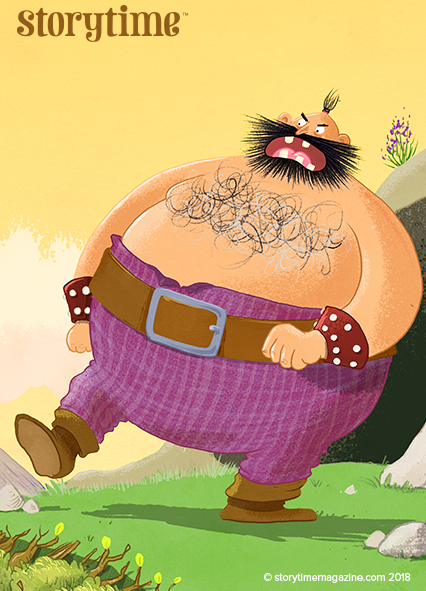 It’s a Welsh legend, sometimes known as Rhitta of the Beards, about a giant who gets a bit too big for his boots. Therefore, he decides to make a cloak from the beards of his competitors. It’s funny, daring and features beards galore, but best of all, it’s set in Snowdonia National Park. I hope you enjoy it! Fantastic illustrations are by Guilherme Franco. We’ve reached letter T in Alphabet Zoo which can only mean TIGER! But also tapirs and toucans. Though we have great fun with our Alphabet Zoo poetry series, there’s a lot to learn and a serious message about conservation too. As always, our illustrations are by Tim Budgen and you can download our free Alphabet Zoo Activity Packs here. Finally, our fable The Golden Plate comes from India and sees a greedy man get what he deserves. If only some of our world leaders had read more fables as children. Pamela Wehrhahne provided the glittering illustrations. It’s another varied issue and features a careful balance of stories and poems that are light-hearted and funny alongside ones that are deeper and more meaningful. The Ugly Duckling is especially poignant – now more than ever. It’s a story of difference, bullying and self-acceptance that we can all learn a lesson from. As we say in the introduction to this issue, we’re all beautiful deep down. Stories are a great place to learn that, along with one of the most valuable skills of all – empathy. Do let us know your favourite stories and illustrations from the issue on Twitter, Facebook or Instagram. We truly value your feedback. A lovely thing about working on Storytime is watching the careers of illustrators we’ve worked with blossom, and cheering them on from the sidelines. We’ve seen many illustrators land their first book deals, win prizes or simply develop their style into something truly unique and special. We think Italian illustrator Gaia Bordicchia has been blessed with a uniquely beautiful and recognisable style from the start, but we’ve loved watching her career go from strength to strength in the last few years. We’ve been incredibly fortunate to continue working with Gaia. 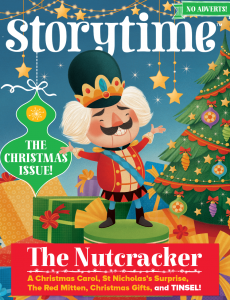 To date, she has illustrated four stories for Storytime, including our magical Nutcracker Christmas cover. 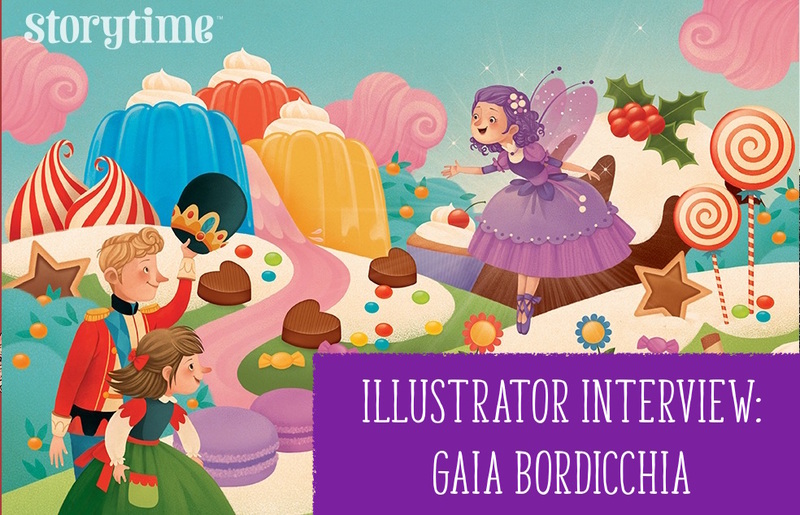 In our latest Storytime Issue 42, she illustrated our fable Little Mouse Makes Friends, so we thought it was high time we featured an illustrator interview with Gaia Bordicchia to give you an insight into her extraordinary creative mind. 1. How did you get started in illustration? Were you arty as a child? Yes, drawing has always been part of my life. My grandad was a painter and bought all kinds of art supplies for my cousins and I. I think every kid enjoys drawing, though for some there’s a sense of wellbeing connected to that moment. Those are the children who could potentially pursue a career in art or illustration, because that very simple feeling stays the same even when you grow up. I didn’t really consider becoming an illustrator until I was 19. 2. Do you have any favourite artists or illustrators who have influenced your work and why? I have so many it’s hard to name all of them! I’m intrigued by stories and I like both children’s books and comics. There are many hugely talented people working today. I grew up admiring Arthur Rackham’s and Edmund Dulac’s fairy-tale llustrations. I’ve always been a big fan of N.C. Wyeth and his son Andrew, as well as Edward Hopper and Norman Rockwell. 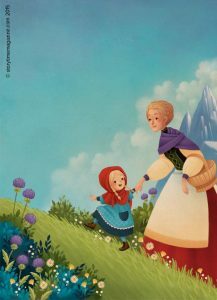 I’m also very interested in French books as the illustrators are excellent – especially Rebecca Dautremer, Annette Marnat and Clement Lefevre. 3. 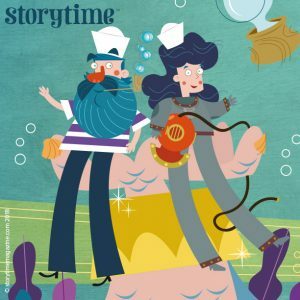 We’ve had the pleasure of working with you on four different stories in Storytime – Fate Finds a Fish, Heidi, The Nutcracker and Little Mouse Makes Friends. Which was your favourite to work on and why? Tough question! I enjoyed all of them for different reasons. Illustrating your cover was a lot of fun (Storytime Issue 27) and The Nutcracker offers so much in terms of detail and atmosphere, but I’m also a huge fan of folk tales and classic fairytales! 4. What was your process for creating your Little Mouse Makes Friends illustrations for Storytime Issue 42? Little Mouse was a bit more experimental. Thank you for trusting me with a new technique! I created a base rendering in pencil and then I added the colors with Photoshop. I also did some minor tweaks to the drawing, but it’s quite different from a fully digital illustration and it’s important that the composition is planned well ahead. 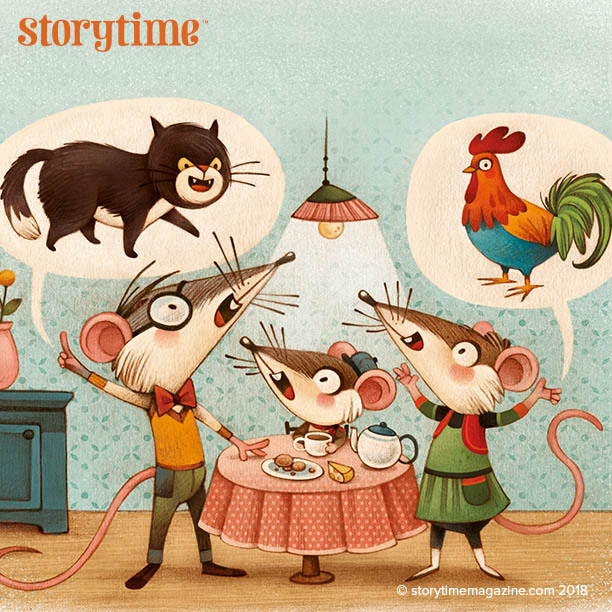 A scene from Little Mouse Makes Friends, illustrated by Gaia for Storytime Issue 42. 5. You’ve had a lot of exciting new projects in the past year as well as moving house and juggling family life. How do you fit it all in and keep the creative spirit going? Do you have any top tips? I try to stay on top of the madness and I often fail! Juggling work and life is always very tricky, but taking care of yourself should be the top priority. We tend to push to the finishing line, often disregarding sleep or fun and it’s a big mistake. I’ve learned to accept the bad days where I can’t get any art done because I’m not in the right headspace. Instead of forcing it, I quit immediately and tend to the practical things (house chores, admin work) or I simply go for a walk. I know that the following day I’ll work twice as much if I allow myself to stop. I’m also a little more careful and realistic with the commissions I take. I try to avoid overlapping schedules, but it’s not always possible. 6. Your illustrations for The Amazing Animal Atlas with Flying Eye Books are stunning. When did your passion for wildlife illustration begin? 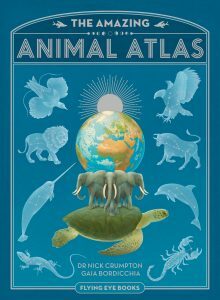 We highly recommend The Amazing Animal Atlas by Nick Crumpton and Gaia Bordicchia. Wildlife illustration is how I started in the late 90s. I took two beautiful classes at the end of my illustration degree. The first with Massimo Demma and the second with Franco Testa, who was Massimo’s former teacher. They worked together in a little studio in Milan and after graduation they invited me as a kind of apprentice. For a few years I had my little desk there, I could use their library and they introduced me to some of the wildlife magazines and clients they had. All the work was done in watercolours, though towards the end of the 90s many of these magazines closed or replaced illustrations with stock photography. In 1998, I was selected for the Illustrators’ Exhibition at Bologna Children’s Book Fair and I stopped working as a wildlife artist. The Amazing Animal Atlas was an incredible opportunity to bring that old world back to life and, even though the art in the book is digital, the process was the same. There is one scorpion on the African spread that is done in watercolors and luckily you can’t tell the difference! Flying Eye asked me to add this element when my computer was broken so I picked up the brushes again for a day. I’m very proud of The Amazing Animal Atlas. It’s the best book I’ve done so far! 7. Looking at your Instagram feed, we see that you’re pretty playful with art supplies. We love your biro drawings. What’s your preferred creative medium and why? I’m an old dog who gets bored very easily so playing is important. I started as a traditional illustrator and I often find computer work frustrating. I love watercolours and pencils. With computer work, I tend to be lazy, because almost everything can be altered at a later stage (colour, composition, etcetera.) Watercolours are one of the least forgiving mediums, so thinking ahead is important and it’s a great exercise. 8. Are there any favourite projects you’re working on at the moment that you can tell us about? I am working on a pop-up with Usborne that will be published next year and I’m finishing a book with Editions Milan. Also I’m very excited about some black and white illustrations I’m developing with my new agent and I hope they will eventually become a story. 9. What would be your dream project or are there any different areas you’d like to explore? As a wildlife artist I’d love to work with museums, botanical gardens and aquariums. I really enjoy collaboration with people who have something new to teach me and scientists are incredibly nice. 10. Is there any advice you can give to children (or aspiring artists) who want to get into illustration? Drawing is a matter of practice, so as long as you’re passionate about it, there is a lot you can learn just by investing your time. Listen to the advice of those who are more experienced than you. Take in what you need and ignore everything that doesn’t ‘feel’ like you or is too big to tackle at the moment. You can always go back to that bit of advice when you’re ready. Illustration is a never-ending learning curve. We never arrive. It can be very frustrating, but it also means that it never gets boring unless you allow it to. Ultimately though, it’s also a business and you’ll be running it as a one-man-band. Don’t be discouraged by rejections, but be prepared and realistic about it. 11. Finally, what would be your dream fairy tale to illustrate? To see more of Gaia’s amazing portfolio, visit her website. It’s a bit like bathing in a rainbow… a tasteful one! You’ll see what we mean. To keep up with her latest work, don’t miss her inspiring Instagram feed, which comes with the occasional video, so you can watch her illustrations in action. You can also catch up with Gaia on Twitter. We hope this has inspired you. Whether you’re a wannabe illustrator or not, there are many gems here for creative types.